Congratulations to all the athletes who won 15 medals at the South Leinster Track and Field Championships. There were many impressive performances on both days. The majority of the medallists go on to compete in the Leinsters on the 16th May and 19th May in Santry. Medallists as follows: Hannah Wilson U.14 1st in javelin and 2nd in shot, Dan Silke Fetherston, Adam Conneely, David Marshall and Peter Hamilton won silver in the 4x300m relay U.16, Donal Conroy, Dan O Conor, Con Creedon, John Shanahan and Jack Doyle won bronze in the 4x100m U.19 relay, Con Creedon won bronze in the 100m U.19, Keela Magee won gold in the 200m U.19 and silver in the 100m U.19, Kate Nurse won silver in the 1500m U.19 and George Lowen won bronze in the U.17 800m. Congratulations to all the athletes involved. Congratulations then to all the athletes who competed in the Leinster Track and Field Championships on Saturday. Keela Magee was placed 3rd in the 100m and 200m U.19, Kate Nurse won silver in the 1500m U.19 and Hannah Wilson won silver in the shot U.15. Hannah and Kate now qualify for the All Irelands which takes place on June 2nd in Tullamore. Only 12 athletes qualify for the national finals in each category and this is an incredible achievement for both the girls. We wish them the very best of luck. After a full year of competitions Newbridge College have WON the All Ireland Championship Title in the Interschools Showjumping. 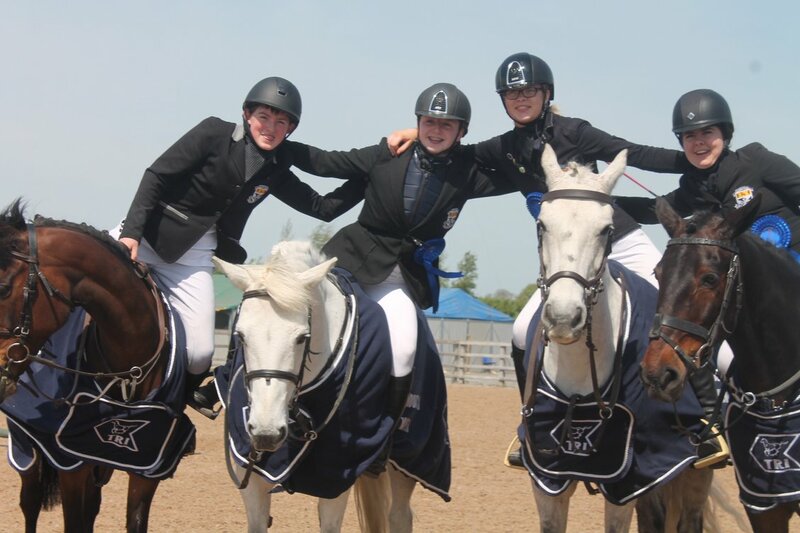 The team of Caragh Sweeney, Leah Heffernan, Niamh Flinter and Max Ross won the competition on the day after a super jump off. With this win they also secured the Overall Championship Title. We must mention Niamh Behan who played her part and has been the super sub all year. Two more cups to be added to the Equestrian Club Cabinet this year. 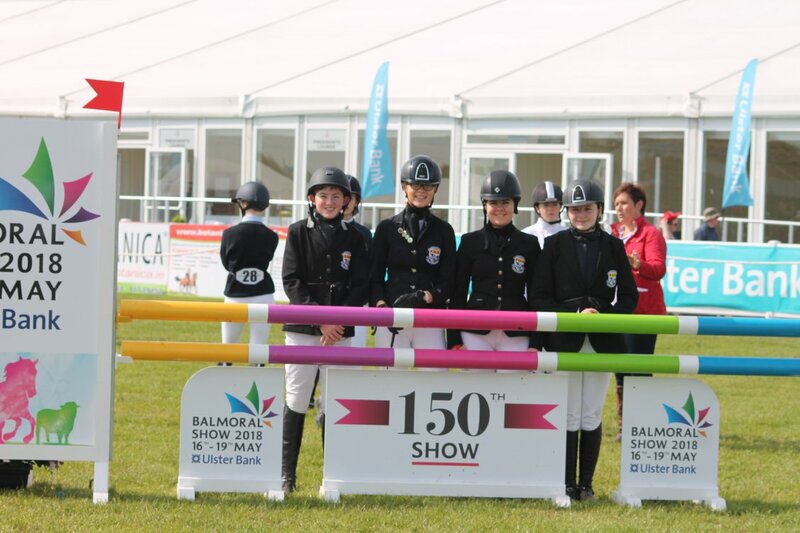 The team of Caragh, Leah, Niamh and Max have won their qualifying ticket to compete in Balmoral on the 19th of May. The team of Caragh Sweeney, Leah Heffernan, Niamh Behan and Max Ross travelled to the Balmoral Show last Friday. Our earlier win in the EII All Ireland's guaranteed us a qualifying place at the show. This is where the top Northern and Southern teams compete in a 2 round challenge on grass tracks in the main international arena. After 4 great rounds from our team we were first of the southern teams and second overall. Another great result for the Equestrian Club. 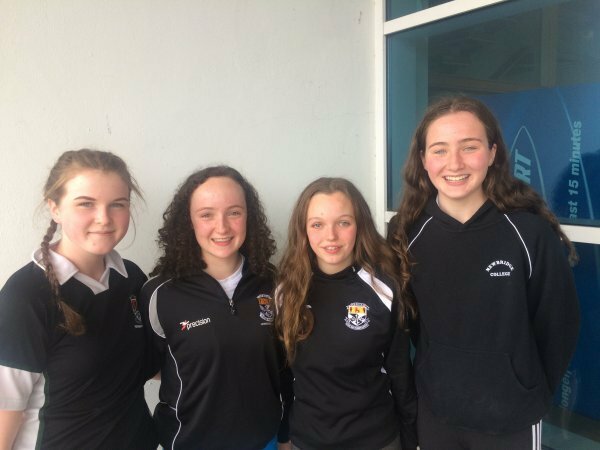 Newbridge College were well represented on Sunday May 20th, at the Leinster Schools Confined Gala in Kilkenny. A total of 14 swimmers (see following list) did the school proud competing in both individual and relay events. 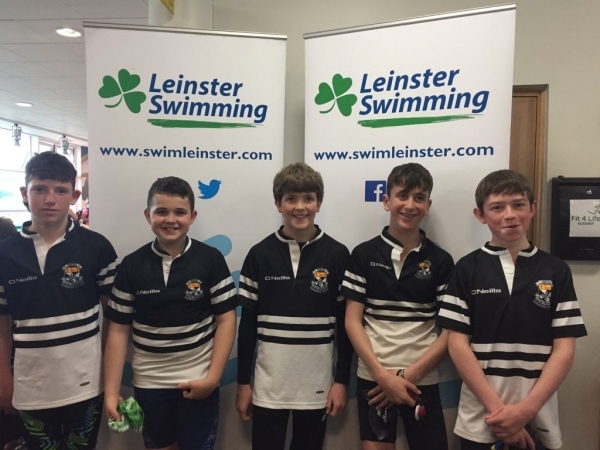 This competition came at the end of a training plan facilitated kindly by the Extra-Curricular Fund which consisted of coached sessions at K-Leisure swimming pool in Naas. The swimmers and parents involved would like to thank the staff and especially office personnel in Newbridge College for their support and look forward to competing again next year for their school with pride.